Russia cruised past the Dutch, while Italy made quick work of Finland to begin Pool E action in Round 2 of the FIVB Men’s World Championships. Four Russian players posted double-digit scoring efforts and the team bested the Dutch in every way in the sweep. Russia outdid the Netherlands in kills (41-32), blocks (8-4), aces (9-3) and points off errors (17-15). Outside hitter Dmitry Volkov notched 15 points, including eight in the opening set, while opposite Maxim Mikhailov (13), outside Egor Kliuka (11) and middle blocker Ilyas Kurkaev (10) followed. Volkov, Mikhailov and Kliuka downed nine kills apiece, while Volkov and Kurkaev were tops on the blocks with three stuffs each. Mikhailov also served up a match-leading four aces, while Volkov chipped in three perfect serves. Outside Thijs Ter Horst was the only Dutch player to reach double-digits, turning in a 13-point effort, including seven in the final stanza. Ter Horst notched a match-high 10 kills and three blocks. Captain Nimir Abdel-Aziz was next on the team with nine points, seven in Set 3, managing seven putaways and two aces. Nimir did not play in the second set as 10 different Dutch players took the court in the stanza. All 14 players saw action for the Netherlands in the match. Russia grabbed ahead 12-8 and turned away any Dutch comeback attempts in a 25-17 Set 1 win. The Russians built a six-point lead at 18-12 in Set 2 and continued on to a 25-16 victory behind Volkov and Mikhailov. The Dutch did not go away quietly, instead going up 5-3 to kick off Set 3. Russia turned the tables with a 9-2 run to vault ahead 12-7. The Netherlands was back within one at 22-21, but could not complete the comeback, falling 25-21. Eleven blocks helped lift Italy past Finland and to its sixth straight win of the World Championships. The hosts outdid the Finns 11-3 on the blocks, 46-39 in kills and 15-9 in points off errors. Both teams served up three aces. 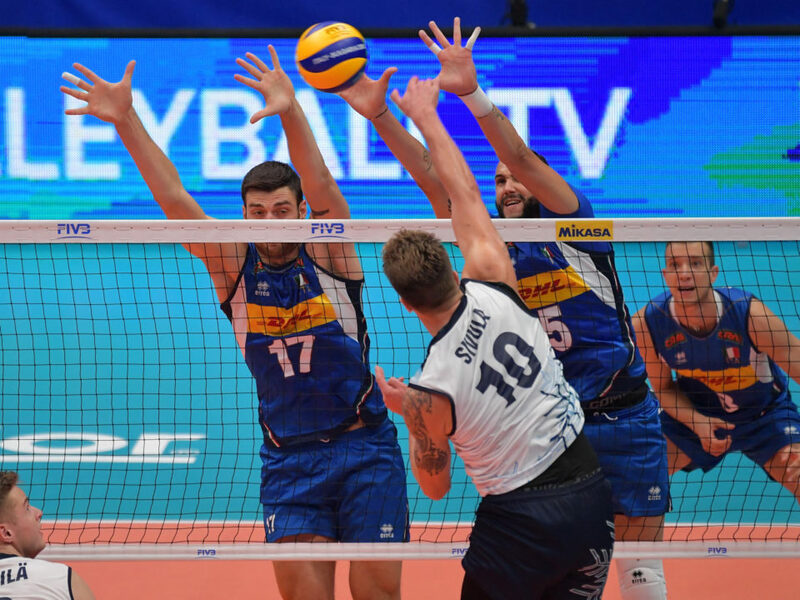 Osmany Juantorena and Ivan Zaytsev notched 14 points apiece to pace the Italians to victory, while three other players chimed in with eight or more points. Juantorena put down a team-best 13 kills and added a block, while Zaytsev accounted for 11 putaways, a team-leading two aces and a block. Daniele Mazzone (10), Simone Anzani (9), Gabriele Maruotti (8) and Simone Giannelli (5) rounded out the scoring. Mazzone notched eight kills and Maruotti added seven. Anzani put up four blocks, while Giannelli added three. Finland utilized 12 players trying to find an answer for the Italians. Urpo Sivula tallied 12 points to lead the team (10 kills, 1 block, 1 ace). Sauli Sinkkonen chipped in eight points with six kills and a team-leading two blocks. Antti Ronkainen managed six points in the final two sets, including two aces, while Samuli Kaislasalo put down six kills in the final stanza.